Slight Problem, cant ban someone for over one week, im running [ /tempban xmikegamingyt 4 week -s Hacking Scrub -_- ] And it says ban time is too long! reducing ban to one week! so.... if u can help, that would be awesome, otherwise, great plugin!!! Same. I looked everywhere in the config and couldn't fix mine. Player trait to join but is Banned! Hi, I test banned myself and it says No appeal site set :(. I'm wondering what is the command for it to set the appeal site. Any know? It's in the config, in the config if you want you can change the whole message it says. Is there a way to put all the bans into a txt file and have it load that when I do /history, because it would then be easier to remove bans that I don't want recorded anymore. Whenever a banned player tries to join it says a message in chat. BlahBlah tried to join but is banned! Amazing Plugin with FULL customization but I have one pet peeve, whenever someone bans someone, the banner's name is always all under-case. Please fix! 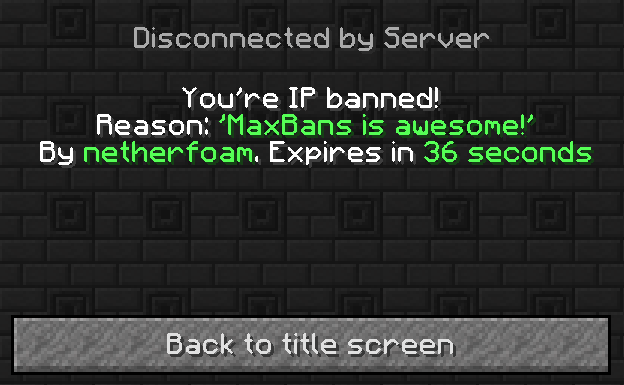 Here is the example from max bans: /tempban NewGuy101 -s 1 hour MaxBans is Awesome! no it's not working i have changce the Plugin to oter Maxbans Plugin from my Dev my Dev has Programmated this Plugin completly new the reason is the plugin its Broken the plugin use for all commands same method as dobble method yeay its fixed and in my plugin its Playerjail inside and more my maxbans plugin is momently biger as Essentials!